Glenn Pendlay: Do You Need to Stomp in Weightlifting? Home » Glenn Pendlay: Do You Need to Stomp in Weightlifting? Well, do you? Glenn Pendlay thinks it’s helpful for weightlifting beginners to stomp or jump because it helps break a bad habit. What Jon’s going to do now is something that looks pretty easy when he does it and is probably not as easy as it looks. He’s going to get in that first position—the power position—bend his knees, now he’s going to jump and catch. He’s going to jump with his legs and catch the bar in the position over his head. Jump and catch. Good. One thing you notice is that he moved his feet and he literally stomped back down on the floor. In weightlifting, for a high-level weightlifter, jumping and stomping is not necessary. In fact, there are a lot of people who even will say that it’s detrimental because it takes extra time to do. However, while we are learning I’m going to ask everyone to jump and stomp. We are probably continually going to be saying we “didn’t hear your feet.” I want to hear your feet. The reason that I do that is because it is far, far, far more common for beginners just learning the lifts to make the mistake of pulling the bar up with the arms instead of relying on the hips and legs and a jumping motion to put the bar over your head. If you think a little bit, you’ll realize if your feet are off the ground, you can’t be pulling up on the bar with your arms. It’s impossible. In my opinion it is better to do a little bit of jumping, which may not be absolutely ideal, in order to learn right from the start to move the bar with your hips and legs instead of pulling up with your arms. The jumping motion is something that will naturally go away in most people—the actual coming off the ground too far will go away in most people as the leg goes up. But if you get in the bad habit of arm pulling, that is very, very hard habit to break. I don’t necessarily emphasize jumping high up in the air. We’re going to emphasize actually hearing your feet as they come back down on the platform. Obviously you can’t stomp your feet without being in the air. That’s going to hopefully keep everybody from arm pulling quite so much. I want Jon to demo that one more time. Stomp. There you go. All right, I want everybody to try to do that. We’re going to come around and help. 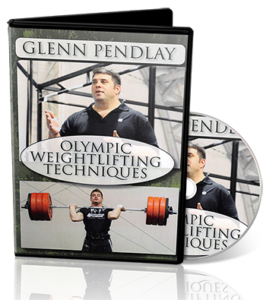 Interested in more from Glenn Pendlay—a top US Olympic weightlifting coach who has coached his lifters to over 100 national championships. He shares this level of experience in this live workshop video, Olympic Weightlifting Techniques.